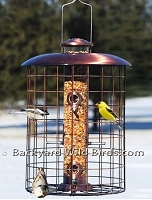 Products include Copper bird feeder pole system components, Copper Bird Feeders, Copper Bird Baths, Copper Bird Bath Fountains, Copper Bird baffles, and Copper weather guards. 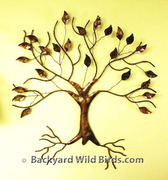 Copper makes a great accent in any backyard landscape. 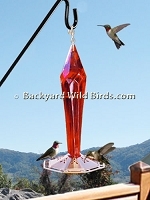 Copper Fruit Jelly Oriole Feeder with jelly cup and posts for their favorite fruit. 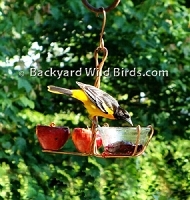 Slice an orange or apple and mount on the two wire hooks and put grape jelly in the glass cup. 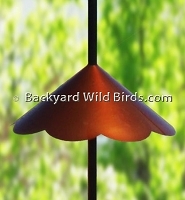 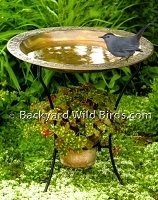 The Copper Oriole Bird Feeder is an Oriole Fruit bird Feeder done in all copper. 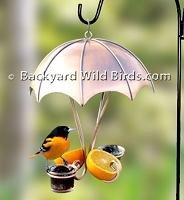 This Oriole bird feeder has both orange halve holders and jelly holders.